The tiny village of Alwinton sits comfortably beneath the rolling foothills of the Cheviots and faces south. It was one of the `Ten towns of Coquetdale` and stands at the junction of two important historic border crossings. Its annual Shepherds` Show is the last of the season and draws visitors from far and wide. Otherwise, for most of the year the village is a peaceful place and an ideal base for exploring the surrounding hills. This walk takes you on an unusual journey over three of the area`s least visited hills and to three exquisite valleys. The views will be outstanding and all the while you will be surrounded by traces of a long and interesting past. As you tramp the green hills, high above Northumberland`s longest river, the Coquet, you will never be more than three crow-flown miles from the cosy and welcoming hearth of Alwinton`s petite `Rose and Thistle ` public house. 1. There is a small Northumberland National Park car park at the centre of Alwinton, just beyond the tiny `Rose and Thistle` public house (NT919063). The name of this fine `watering hole` refers to the Union of the Crowns and is a reminder that the border is only a matter of miles away. Leave the car park by turning left along the tarmac road and then cut across the small village green. Go over the wooden footbridge, which straddles the trickle of the Hosedon Burn, before turning left to follow Clennell Street in the direction of the distant Border Ridge. 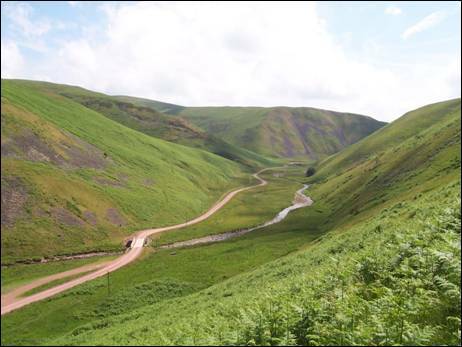 This track is one of the great drove roads over the Cheviot Hills, linking Morpeth, on the English side of the border, with Kelso, on the Scottish side. A previous name for this road was `Ermspeth`, which is Old English for `eagles path`, and this perhaps indicates the age of this once vital route across the border. Follow the track as it climbs gently past a farm and continue as far as the metal gate and the near vertical ladder stile (NT 923069). Climb over and, on reaching the other side, turn left and head alongside the boundary wall and fence towards the small saddle between the prominent rocky slopes of Castle Hills. 2. Continue across the saddle and turn right to cut diagonally down the steep hillside to the exquisite valley of the Hosedon Burn. 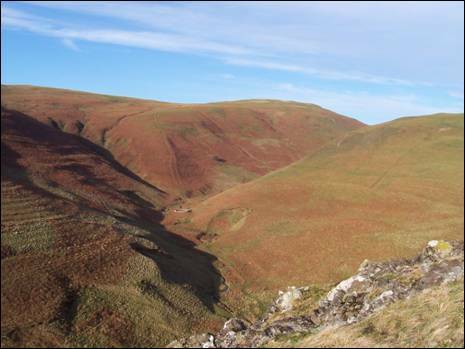 This is one of the hidden gems of the Cheviot Hills, often seen from above by walkers heading north on Clennell Street, but rarely visited. Standing here, surrounded by steep slopes dropping precipitously to the narrow twisting burn, there is a sense of scale far greater than the actual height of the surrounding hills. You are now heading towards your first hill of the day, the 392 metre high Lords Seat. Keeping to the right hand side of the burn and the intermittent path, aim for the circular sheep stell higher up the valley and the obvious `nose` of Lords Seat immediately beyond (NT 915073). You will, inevitably, need to criss-cross the burn as you make your way forwards as this area can be exceedingly damp especially after heavy rain. Once past the stell, with the deep hillside cutting cleft to your left and the upper reaches of the valley to your right, commence the tough climb, on a faint path, up the bracken-covered `nose`. When the gradient begins to ease, turn slightly to your right and head in a northerly direction towards the cairn topped summit of Lords Seat. Rest awhile and enjoy the expansive views towards Bloodybush Edge, Cushat Law and Wether Cairn as they pop their heads above the green mass of the Kidland Forest. 3. Now turn south westwards and start the easy ¾ mile journey to your next objective, Green Side. 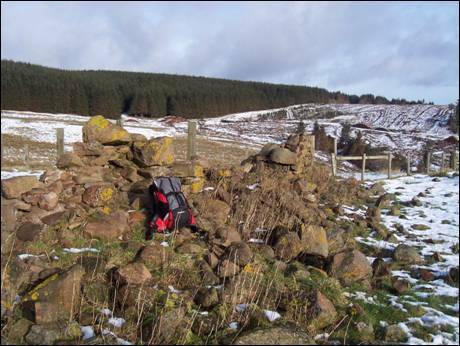 On reaching the fence, with an old boundary stone to the right of the gate on the other side, go through the gate (NT 909078) and pick up the quad track which heads in the general direction of the summit. Once again the views from the top are impressive, none more so than the bulk of Shillhope Law and the adjoining valleys. A few years ago the trig point had lost its top but this has since been replaced. The `break` in the pillar is still clearly evident so, perhaps not a trig point to stand on the top of! It is time now to head downhill, in a south westerly direction, towards the Pass Peth. On reaching the 300 metre contour, relatively level ground, a track and a directional fingerpost (NT 897068), turn right and take time to soak up the fantastic view up Coquetdale. On this exposed height, four centuries ago, the men of Upper Coquetdale took turns to stand watch, night and day, guarding against the incursions of the Scottish freebooters. The views do not get much better than this! Now for the exciting descent of the Pass Peth, as it cuts diagonally across the steep north western flank of Green Side. Once at the bottom, and back in Coquetdale, you will very soon cross Passpeth Sike, surrounded by a relatively new fenced-in plantation which you will pass through via a five bar gate and two smaller gates. Less than ½ mile up stream, lies a large rectangular enclosure containing the remains of three houses. These are believed to be part of the medieval settlement of `Whiteside`, which appeared on a 16th century map of the area. 4. Continuing north westwards, you are now contouring the Knocks on a clear single line path, with the River Coquet wriggling away to your left. Continue to walk straight ahead, crossing via a small wooden footbridge, first the delightful Wholehope Burn, tumbling down from your right, and then alongside a wall on your left. When a gravel track is joined, where there is a directional fingerpost (NT 887076), turn right and begin the 2 mile long climb up Copper Snout to the summit of Saughy Hill. The strangely named Copper Snout was once a branch of the drove road Clennell Street, a track you will rejoin once this particular unforgiving uphill stretch is behind you. Remember to keep pausing as you go. The views continue to please and, once again, Shillhope Law dominates. Be careful not to follow the side track which turns away to your right around the 420 metre contour, where once again a directional fingerpost points the way (NT 890095). Eventually, when a step stile is reached, the second one on your uphill journey, catch your breath, cross over and leave the path in a north westerly direction, with a circular sheep stell to your right (NT 893102). A helpful quad track leads you towards the 494 metre top of Saughy Hill. There are excellent views back over Copper Snout and to the valley of the Usway Burn. Now return to the path by heading the way that you came and once you have reached the sheep stell, turn left with a post and wire fence to your right. This path, which is rarely dry, will soon lead you onto the gravel track of Clennell Street. Once there, right along the track, passing through a stretch of recently harvested forest and when the track decides to bend away to your left, keep straight ahead, passing through a couple of five bar gates and onto a green track. 5. To your left, immediately in front of the tin shed, is the site of the former shepherd cottage of Wholehope, purchased, together with adjoining land, by the Ministry of Defence in 1941. Subsequently, during the latter part of the Second World War, the uninhabited building fell into disrepair. In 1949, the building was returned to a reasonable state of habitation by a team of volunteers and, in April of that year, began to operate as a basic Youth Hostel. In an age when personal transport was rare, the existence and location of the hostel helped to open up a whole new area of hill country to weekend walkers. For the majority of the time it was bursting at the seams. Whilst it officially remained a Youth Hostel until 1965, it had since 1953 been in a state of terminal decline. It had become, in essence, one of northern England`s unofficial open bothies when, in 1967, the fledgling Mountain Bothies Association attempted to obtain permission to repair and maintain the building on an official basis. Unfortunately, permission was never forthcoming and, at some point during the 1970`s, the major part of the building was demolished. How many happy hostelling memories must now wander lost among these bare bones of a building? 6. Continue downhill along the green track, in a south easterly direction, crossing first a step stile and then passing on your left the boundary of the Kidland Forest, now (as at 2016) substantially harvested in this area. This is pleasant walking country and soon you begin to contour the slight rise of Uplaw Knowe. 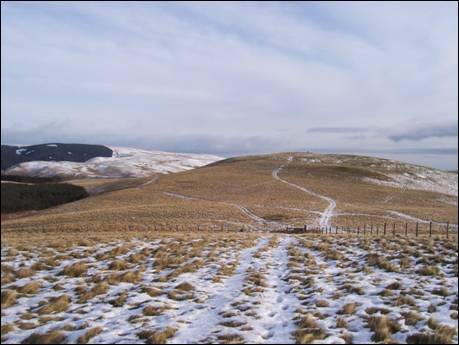 At the highest point, a secondary track turns away from Clennell Street to your left (NT 913087) and heads downhill towards what was, until recently, the most southerly point of the forest. The trees hereabouts have now been harvested although the remnants can still be seen. Take this track, which cuts across the harvested edge and through a five bar gate, turning in due course towards the north east. Ignore the track heading to the right. Not far from here, on your right hand side, lie the remains of a Romano-British period (AD43-AD410) settlement consisting of five or six small enclosures, with associated hut circles. Around the settlement, which was probably occupied by two or three families, are the faint remains of a field system. 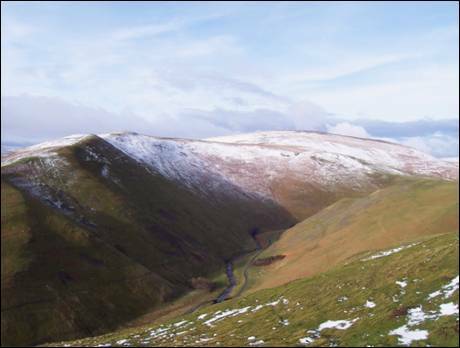 The downhill slope begins to steepen, making this one of the most exhilarating descents in the Cheviot Hills. You will now be in sight of the River Alwin and the hills that rise sharply up from the valley on the eastern side. This is a splendid vantage point as you drop, like a stone, towards the red gravel valley track (NT 919091). At the bottom, ignore the path which heads diagonally uphill and is signposted `Alwinton`. 7. This uphill path was the `sting in the tail` of the now defunct annual 14 mile Alwinton Fell Race, which was normally held on the second Saturday in June. The runners, having started the race in Alwinton, headed up Clennell Street before crossing the summits of Bloodybush Edge and Cushat Law. An exciting descent through the Kidland Forest eventually lead the contestants to this very spot. However, their route back to Alwinton headed uphill, before rejoining Clennell Street just north of Castle Hills from where it is all rapidly downhill. Your way back takes a gentler route, so cross over the step stile and turn right. It is now time for you to enjoy the easy 1¾ mile walk down the valley, alongside the River Alwin, towards Clennell Hall. This river is one of the many tributaries of the 57 mile (125 km) long River Coquet, a river designated a Site of Special Scientific Interest (SSSI) under the Wildlife and Countryside Act 1981. 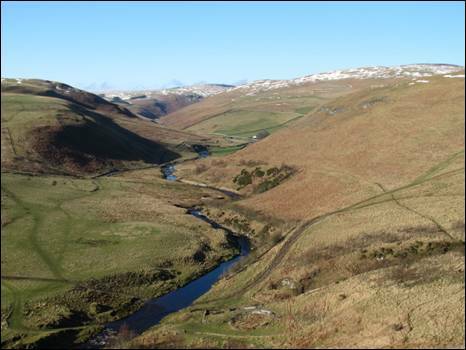 The SSSI also includes the River Alwin, together with parts of the Allerhope, Yoke and White Burns, deep within the cloak of the Kidland Forest. On reaching Clennell Hall and the cattle grid, cross over the iron and concrete bridge (NT 928070) on the right of the track, turn left on the other side and climb up the bank following a clear path. Then, cross over the step stile and head across the fields. Ahead, you will see the twin tops of Castle Hills. When reached, cross over the ladder stile and turn left down Clennell Street, familiar from your outward journey. It is now only a matter of walking over the wooden footbridge over the Hosedon Burn and heading back to the car park. The temptation of a long and cool drink in the `Rose and Thistle` will, perhaps, delay your arrival back to the car. You have certainly earned it!